How was your weekend, my fellow style mavens? Mine was spent with friends, some fall cleaning that consisted of me purging a substantial chunk of my current wardrobe, and some contemplation on the coming season and what items would make a great addition to my closet. When it came to deciding which pieces would stay and which would go, I chose to donate items that I hadn’t wore for at least two years, unless they were quality pieces that could stand the test of time and outlive any fashion trend. At first, the task made me feel a little anxious, but now I feel relief from de-cluttering my closet space, and from actually having room to rebuild my wardrobe with more of those quality pieces that I covet. 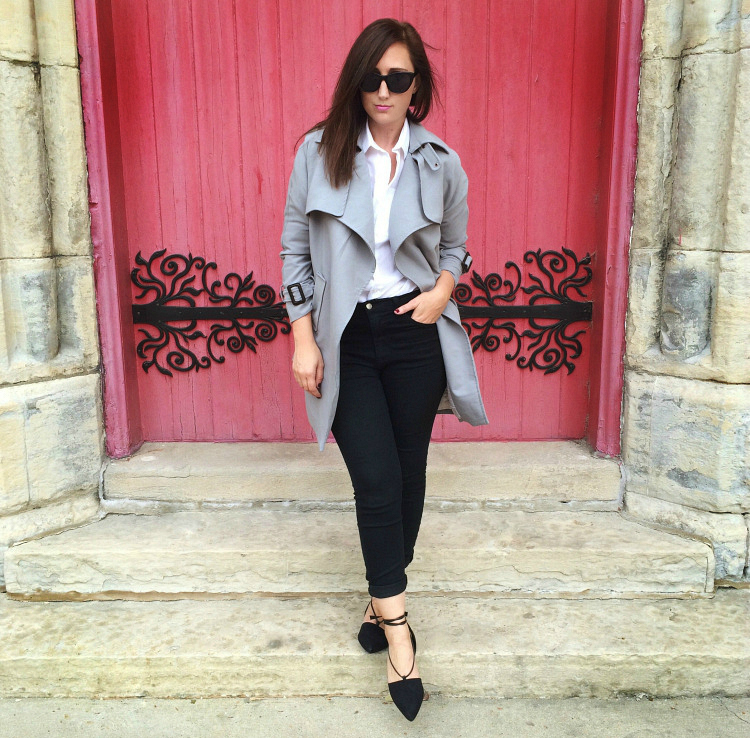 However, one piece that is always timeless is the trench coat. I usually stock my closet with at least one new one every season, because the item is such a classic that you simply can never have too many. What other items am I looking forward to building my fall wardrobe around? Well, lace-up flats are a great and comfortable piece of footwear to have, and so is a great fitting pair of black jeans and a classic bag. And while I may still be on the hunt for that perfect classic bag, I am definitely on the right track when it comes to the others. I love stocking up on new coats this time of year! Chic outfit! I definitely have to go through my closet and get rid of some clothes. My lease is up in about a month so it’ll be the perfect time to get rid of some clothes that I don’t wear. Thanks for inspiring to do it sooner though! Oh my gosh, that trench is so amazing, love the color! I’ve never owned a trench coat since I live in LA and only dream of “needing” one, I’ve actually been looking for a shorter length version, love this! do you mind sharing what size your coat is? I just can’t seem to get my sizing right with chicwish.com and we appear to be similar sizes. Thank you so much!!!!! No problem! It is a size Large. Hope this helps!